The Pennsauken-Merchantville Area Chamber of Commerce assists with toy collections and monetary donations for the annual Community Angel Tree Program. The toys and funds collected go towards helping families in need during the holiday season. The Angel Tree Program started over 20 years ago by former Pennsauken Township Administrator, Ken Carruth and long time Pennsauken resident and business owner, Bernie Kofoet. The two gentleman placed a Christmas Tree at the Penn Queen Diner, allowing fellow members of the community an opportunity to help their neighbors in need during the holidays. The success of that endeavor turned into today’s Community Angel Tree program. 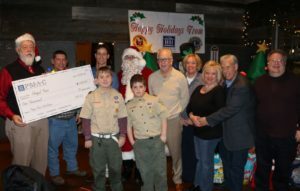 Local residents and businesses continue to join together to help the less fortunate families in and around the community. The efforts to raise funds for the Angel Tree begins in the summer months. P.M.A.C. co-hosts the Angel Tree Luau through the generosity of the Hernandez Family of Inglesby & Sons Funeral Home. In the beginning of December, P.M.A.C. co-hosts the Holiday Happy Hour. The event has been hosted by local restaurants such as the 45th Street Pub, Pinsetter Bar & Bowl and Marco’s @ the Pennsauken Country Club who have generously provided food and drink specials and the attendees are asked to donate an unwrapped toy. Monetary and toy donations are presented to Pennsauken Township employees and are distributed to local families in need.